At the village swimming pool, on a bluff high above the Little Miami River, an Ohio Historical Marker recognizes one of the most important archaeological sites in eastern North America. It’s long been known that American Indians buried more than 1,000 of their dead at this place, which archaeologists call the Madisonville site. The historical marker says it is “the largest and most thoroughly studied” site of the late Fort Ancient culture, which spanned the years from 1450 to 1670. And yet, since 1879, when physician and archaeologist Charles Metz began excavating the burial grounds and identified an earthwork built by the Indians, major mystery has lingered: Where, exactly, did those people live? 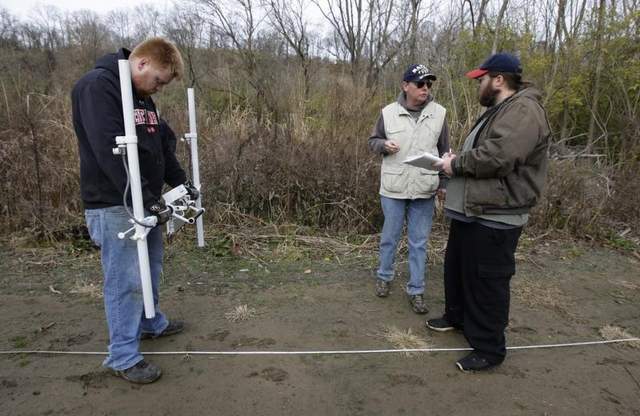 Two weeks ago, on the flood plain below the bluff, students of University of Cincinnati anthropology professor Ken Tankersley dug up what they believe is the answer. And it lies in the path of a proposed highway. Drawings released this year by the Eastern Corridor project show that officials are considering relocating Ohio 32 through Mariemont’s Gardens and Trails Park, where the newly discovered Indian village is located. The Eastern Corridor is a massive transportation project, still in the planning stages, aimed at improving the connections between downtown Cincinnati and western Clermont County. Mariemont Mayor Dan Policastro doesn’t want the highway in his village and hopes the new discovery prevents that from happening. “We have an obligation to save this area for the future,” he said. Ohio Department of Transportation spokeswoman Sharon Smigielski said it’s too soon to say what effect the discovery might have on the proposed route. “We would in all likelihood bring in our own archaeologist to examine the site and assess it,” she said. It was Policastro who, after learning of the proposed Ohio 32 relocation, contacted Tankersley. Each year the professor and students in his public archaeology class take on a preservation project involving a threatened historic resource. Tankersley, 57, was a high school student 40 years ago when he first began looking for the Indian village. Although portions of the mound have been lost to erosion, it runs for nearly 3,000 feet along a ridge that follows Mariemont’s Miami Bluff Drive. The mound is made of sand that Fort Ancient Indians hauled from the Little Miami flood plain. Some experts had theorized that the Indian village must have been on the hill near the mound. But no artifacts turned up when modern homes were constructed in the area. In late September, Tankersley’s students began searching in the flood plain below the hill. They dug with shovels, then screened the dirt through mesh. After almost five weeks, all they had found were were bits of asphalt and glass, and some railroad slag. Then, two weeks ago, Mike Forbes, a fifth-year archaeology major from Covington, found a piece of chert, a rock used to make stone tools. “Then I found bone, and I got really excited,” he said. The next day, third-year geology major Michael Karaus from Oakley discovered an arrowhead that Tankersley said dates from the 17th century. “You’re holding it, thinking, no one has held this for hundreds of years,” said Joe Shaffer, an archaeology graduate student from Lebanon. Soon more artifacts turned up, including shell-tempered pottery, the same type that earlier researchers had found buried with bodies in the cemetery on the bluff. It all “pointed to this being a habitation site,” Shaffer said. Artifacts found by the team, including pieces of pottery, tools for skinning animals and arrowheads, are typical of the period from 1600 to 1700, Tankersley said. Drooker, curator of anthropology emerita for the New York State Museum, wrote a book about excavations of the Madisonville site, including those conducted by Harvard University until 1911. Artifacts from the site are housed in major museums all over the world. The Madisonville site – so named because the village of Mariemont didn’t exist when it was discovered – was occupied into the early 1600s, she said, and appears to have been an important trade center. More study will be needed, she said, to determine if people occupied the newly discovered village at the same time. Tankersley said the villagers survived by hunting wild game, gathering wild plant foods, and growing maize, squash and beans. That will give the team a good idea of where to dig, which they plan to do before the area floods next spring.